7S Hook – IM New! Five Sugars – PU New! Beach Cruiser – Soft New! Flounder Pounder – Soft New! Slip In – CV New! Double Wide – XB New! Love Child – XB New! The Boss – XB New! Due Back – MX New! Outer Reef – MX New! T6 FiberGlass Lever Lock 3 Piece New! FCS II Hang up New! How to insert original FCS Hang Up New! How to insert FCSII Hang Up New! How to insert Futures Hang Up New! How to insert a Longboard Hang Up New! How to insert a SUP Hang Up New! The Adventure Paddleboarding Sixty Forty Stand Up Paddleboard is designed for 60% surf use and 40% flat water paddling. This dual-purpose hybrid SUP is a great option for the cross-training enthusiast who likes to transfer from the surf to flat water without missing a beat. OUTLINE: The relatively full outline and generous width though the mid zone provides exceptional stability during flat water excursions. Plenty of curve along the rail line maximises turning performance, and a pulled-in tail allows the board to pivot smoothly in the surf. 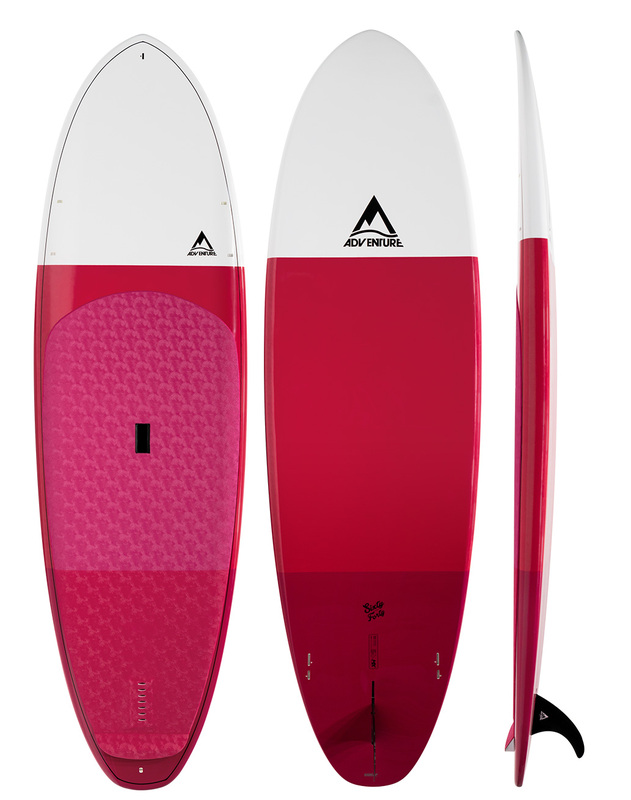 ROCKER: The rocker is designed primarily for the surf with a little extra lift in the nose and tail compared to the Adventure Paddleboarding Fifty Fifty, so it fits nicely with the curve of the wave and also makes turning easy. A relaxed section through the middle helps maintain flow and forward acceleration in flat water. VOLUME: While most of the volume resides through the mid-section, the nose and tail have been foiled to enhance turning sensitivity. Soft, high volume rails provide exceptional stability and are very forgiving when pivoting off the tail. FEATURES: Comfortable cavity handle for convenient transportation, soft deck traction with integrated arch bar and tail kick. Additional nose plugs for creating a forward storage zone, plus a bonus nose plug for mounting a GoPro. PERFORMANCE: The subtle displacement hull reduces slapping in bumpier surf conditions, single concave through the middle maintains down-the-line speed, and double concave vee out the tail enhances rail-to-rail sensitivity. Representing great value for money in our Molded Epoxy (MX) construction, this cross-training SUP offers the perfect mix of fun and fitness. Production weights: 9’4 – 10.2kg / 22.48lbs | 10’0 – 11.32kg / 24.95lb. Molded Epoxy (MX) construction delivers structural integrity through the high pressure molding of multiple components. The components being; a medium density EPS core, 5 layers of Fiberglass (3 x deck, 2 x bottom) and a special epoxy resin that’s mixed with carbon strands. Encapsulating the whole board, and forming an outer skin that bonds through to the core, this combination of materials is fused together for over 4 hours under constant heat and pressure. The result is a very durable, well weighted board, and the high pressure molding process ensures that each board is identical to our specifications. You can find out more about GSI’s surfboard construction on our SUP construction page.